Seller: Night & Day Studios, Inc.
© Night & Day Studios, Inc. I love using this app in speech therapy. The kids love it and it almost feels open-world, like you can just explore. Each scene has several animal friends to find, which you see with the rustling of leaves or a tail behind a stump. You can ask what questions, label animals, imitate the sounds your hear, and more! I highly recommend this app! Not as good as Peekaboo Barn! My one-year-old loves Peekaboo Barn, so I bought the package to get four other Peekaboo apps. He does not like any of the other Peekaboo apps like he does Peekaboo Barn. The other ones just aren’t as fun. I would not suggest getting the package. The 'Peekaboo' apps are awesome! My 16 month old boy loves them! We listen to them over and over again! Well worth the money! My twin girls live this app!! Great app! Teaches forest animals and seasons! My 20 month old likes this app but not as much as barn or wild. My son loves peekaboo barn and wild. Peekaboo forest just doesn't have the same feeling. The art is much more "artistic" and much less cartoony, which is a bad thing for a young child if you want them to play with it. The music suffers from the same flaw. It is not fun music like we heard in wild and barn. I'd return it if the app store allowed it. 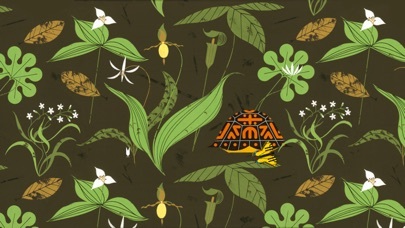 The colors are very muted in this one, and it's hard to find the animal, even when it pops out. My 14 month old loves the barn version, and he got bored with this one on the 2nd time around. Nice art but way too short. My 2 yr. old loves it. I really expected more for the price. Graphics are beautiful but didn't grab my little ones attention. Sound cues were also sparse. They also announce the names quickly beating my little one to the punch. not my favorite but glad I have nonetheless. This is another nice app. Images of animals can be small, so maybe it's more suited to the iPad. My only critique is that the start button is the wrong color. Barn and wild use green start buttons, forest uses a red one instead. This is confusing for my son. The illustrations are great. Yes. But $2 for four screens of animals that don't do much? False. Sorry I got it. We're huge fans of Peekaboo Barn & Wild so we decided to give this one a try. Color scheme is boring/stark, many animals are very hard to see moving or small and my son lost interest almost immediately. It's very artistic; I can appreciate it as an adult, but it's not for a toddler. I have a few friends who are also fans of the Peekaboo series and it came up in discussion the other day. We also agreed it's a waste of $$$. Would have liked more animals, but the graphics are so beautiful. My toddler loves it. Excellent! My daughter loves it! This app doesn't have much substance. There aren't enough animals. The graphics are nice,but not colorful enough to grab the attention of a toddler. This app is not as good as the barn or wild. It is really disappointing. Strongly suggest skipping this app! Got PABF and other apps (some by Night & Day as well) for my 1 year old and was really bummed when there was no sound. Apple didn't help and recommended contacting app developer...Dave totally helped me figure it out and now I have more sound on my iPad than I know what to do with! There is not many animals, but kids LOVE the repetition. Thanks Night & Day! 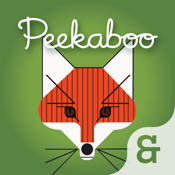 This app is adorable - we have both Peekaboo Farm and Wild. My two year old adores them. However, Forest features smaller, less visible creatures that make it harder for a young child to tap with their fingers or see on the screen. That's the only drawback. My 18 month old LOVES this app! He loves naming the animals and seasons out loud, and I love the Charlie Harper artwork. Just a lovely app. Make more like this! My 12 mo. old daughter loves this app! My 17 month loves all of these...peekaboo barn, forest, and wild! I just purchased this app today for our 3 year old, and she loves it! 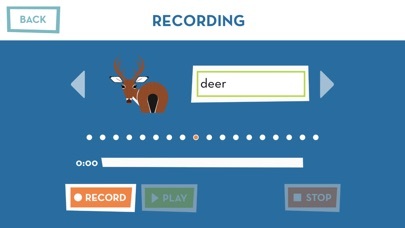 I love that you can record your own voice saying the names of the animals. We recorded her siblings saying the names, and it has only added to her delight when the animal is named. The app is quiet, peaceful, and very pleasant to look at. The graphics are lovely and simple. The noises are realistic and calm, not over the top and loud. We look for apps that are not so overly stimulating for our kids, and this one fit the bill perfectly. Very happy! The one thing that I hope is improved in the future is ease of navigation. There is no easy way to go back, forward, or stay on a page if you like. Other than that, no complaints! Broke the awesome doors opening and closing format of discovery- it's unclear presentation of animals is further dulled by a woman's "Siri" like voice as opposed to the cute kid voice on the other apps. So lame!!!!! Our family lives by the national Forest in Flagstaff, so I was excited about this second peekaboo game. But it was a big disappointment for me. There's not much content, it is not randomized, and the animals often are not fully shown. The developers really need to revisit this game, and flesh it out more. 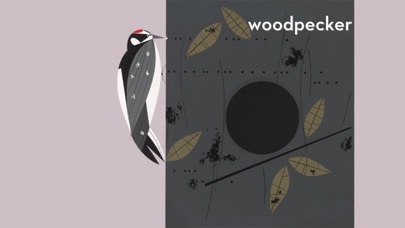 If you are a Charley Harper fan this book is a MUST have! Done beautifully! Entertaining! A great way to introduce my son to one of my favorite artist. Even if you don't have kids it's still fun to skim through...I think I've read it more than my son has. Doesn't seem like this was adequately tested prior to being released. Only 4 scenes, not very interactive, lame music, sloooow paced. My 16 month old wasn't interested at all. Cute illustrations though. 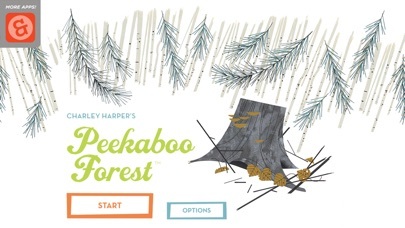 Our kids love all the peekaboo apps: Barn, Wild, AND Forest! The raccoon and butterfly are favorites! My 10 month old loves this app. I love it too, plus the music is nice & calm. we (I and my 2 year old) loved the peekaboo barn and peekaboo wild apps, got the forest...ehmmmm...it's not bad, but why did they change the voice over from cute little kid to a female voice from the evening news? dunno...we definitely liked the kid's voice better. I liked barn and wild a lot, but forest takes these apps to a whole new level. The art is beautiful and sophisticated and yet my 2 year old daughter appreciates it as much as I do. Bottom line: if you have little kids, get it now! Beautiful art and very cute animation. My 19-month-old son absolutely LOVES Peekaboo Barn and Peekaboo Wild. Those are the only 2 apps that he really "plays" at his young age. Maybe he'll like Peekaboo Forest when he's a few years older, but for now I'm left wishing I could get my $1.99 back. I really wish this one was more like the other 2. Unlike Peekaboo Barn and Wild, which feel better aimed at an under two crowd, this version is a little too nuanced to be as engrossing. Our eager likes it, just differently. Also, a particular gripe: Why is there a frog in the winter season? All other animals seem seasonally appropriate. Please change this. My 21-month-old loves this app, even more than Peekaboo Barn. He sways to the music and giggles when the animals appear. Peekaboo barn is much better than peekaboo forest. Don't expect to like forest just because you like barn. The art is fantastic! It could have been longer, even a toddlers attention span is longer than this. BUT overall, I really enjoyed this app and love sharing beautiful art with my child. Waste of money. There are 4 scenes and maybe 4 animals pop out of each one, make a sound and go away. It's slow moving and boring. Barely any content. Now it won't let me submit the review.No wonder there was only 1 great review for this junk. My daughter loves the other versions of Peekaboo but this one she just isn't interested in. It's incredibly slow and quiet, the animals don't make very exciting sounds (which was her favorite part of the other games). I would highly recommend purchasing the other games and not this one. This one is included in the group of peekaboos but it shouldn't be.. wayyyy to different & not in a good way. Animals are to hard to spot, to small, & since when is a frog out in the winter?! If you're gonna buy one get peekaboo barn or wild. This review is for the updated version. There are many glitches now. Every page has an additional graphic that is moving, frustrating my 2-year old to no end. 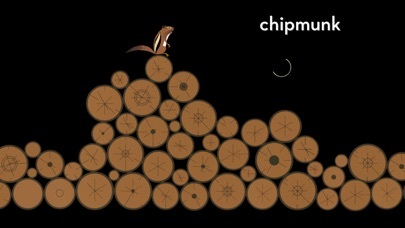 (FYI, they are the butterfly, chipmunk tail, woodpecker...then he shut it off when the winter scene came around again.) This is normally a beautiful, captivating app for the youngest members of the family (4 stars only because we'd like to see more for the price we paid), but until it's fixed, I'm taking it off our iPad. This is a beautifully done app. The art work is lovely, interesting things happen to move a child along the discovery and the ability to record your voice is very creative! My daughter (15 months) loves peekaboo barn but she is not a fan of this game. The animals are too small, the animations are not very sophisticated, and for some of the animals only the head is shown. How luck that this was the first app I purchased for my lil man! Think I love it more than he does, so far, he's 7 months. I love that they used realistic sounds, the names of the animal is visual and spoken and the voices of children tops it off. Great app and I'll be looking for more like this. Small, not well animated, boring for toddlers. Get the other peek a boo apps instead. Beautiful artwork, but the animals are way too small! I thought this app would b similar to the Peekaboo Wild and Barn but it wasn't. I should have looked closer but I just assumed and ordered it. The graphics are so beautiful but they r broken up by season and some are pretty small and hard to really see. It will b nice for when my son is older but I think I wasted money on it. I cannot believe I paid $1.99 for this. Worse thing I have gotten for the kids. The other peekaboos that are free are so much better than this. I am really disappointed. Boring. Cannot locate animals. Colors are drab. Not a good one. My 2 yr old enjoys this as he does all peekaboo games. Beautifully designed but needs more to it. My 20 month old got bored after 2 rounds through the seasons. My 1.5 year old loves the peekaboo barn and peekaboo wild so I bought this. It's nothing like the other two. I wish I hadn't bought it. I LOVE LOVE LOVE THIS APP! So adorable and the artwork is stunning! Hands down the most beautiful & enchanting (as well as modern) graphic design of the three tried, true, & best beloved peekaboo apps from this studio! Bravo!! My 2 year-old is entertained & engaged for hours with the peekaboo apps- has been for a year and I suspect will be for another at least! The Charley Harper graphics are amazing and my two year old niece is obsessed with this app! Yes, I agree it isn't as much fun for my 2 year old as Peekaboo Barn, but... The art by Charley Harper is beautiful, he animations are cute, and the kids voices are adorable. It still is a quality app compared to some of the other kid junk out there. I am a special education prek teacher. My students have very limited speech. They love love love peek a boo barn and will do the animal sounds. Peek a boo forest while still cute is not as good. The animals are harder to find and my students can't be as independent with this one. Disappointing. My 20 month old loves Peek-a-Boo Barn but this one is so boring compared to that one. It's slow, dark, and you can barely see some of the animals. She gets frustrated with it. I almost didn't buy this because the reviews were not as good as Peekaboo Barn. I'm so glad I decided to give it a try. In my opinion, this app is much better than Barn. This app has more animation and I love the different backgrounds instead of looking at the one dumb barn. Also, better suited for the animals we see in our background.